MENLO PARK, Calif., Sept. 24, 2018 /PRNewswire/ -- The drive to work may be driving some professionals to quit, suggests new research from global staffing firm Robert Half. More than one in five employees (23 percent) have left a job because of a bad commute. Among workers in the 28 U.S. cities surveyed, respondents in Chicago, Miami, New York and San Francisco have most often resigned for this reason. While 39 percent of professionals reported their travel to and from the office has improved over the past five years, 22 percent said the trip has gotten worse. Of those who noted a negative change in their commute, 60 percent said their company has not taken steps to reduce the burden on employees. 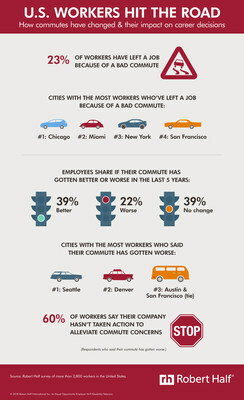 View an infographic about commutes. Data tables with a breakdown of the results by gender and age are also available. Professionals ages 18 to 34 (34 percent) have most often left a job because of their journey to and from the office, compared to those ages 35 to 54 (24 percent) and 55 and older (12 percent). Twenty-eight percent of male employees have quit due to a bad commute, versus 20 percent of women. Workers in Miami (66 percent), Los Angeles (58 percent), New York (53 percent) and Charlotte (46 percent) noted the greatest improvement in the trip to work in the past five years. More professionals ages 18 to 34 (56 percent) said their commute to the office has improved over the last five years than those ages 35 to 54 (37 percent) and 55 and older (24 percent). Sixty-six percent of women said their company hasn't taken action to address employees' commute concerns versus 51 percent of men. "Commutes can have a major impact on morale and, ultimately, an employee's decision to stay with or leave a job," said Paul McDonald, senior executive director for Robert Half. "In today's candidate-driven market, skilled workers can have multiple offers on the table. Professionals may not need to put up with a lengthy or stressful trip to the office if there are better options available." McDonald added, "To help ease commuting woes, companies can offer remote work options, flexible scheduling or transportation amenities." The survey was developed by Robert Half and conducted by an independent research firm. It includes responses from more than 2,800 workers 18 years of age or older and employed in office environments in 28 major U.S. cities. Founded in 1948, Robert Half is the world's first and largest specialized staffing firm. The company has more than 300 staffing locations worldwide and offers job search services at roberthalf.com. For additional career and management advice, visit the Robert Half blog at roberthalf.com/blog.